What does one do with some 20 lbs of cherries and I think this might be a solution to a lot of those problems I encounter when I buy or get greedy picking way too many fruit at farms? Provided you can get someone to pit the cherries for you (insert spouse or kids here for said task), you do a whole lotta crazy stuff besides cooking dishes and desserts with them. You can and should also make this cherry salt. It's an easy recipe, fresh cherry bits with Maldon salt flakes. As my friend Jenny says, it goes great with cherry flavored margaritas but you can use it season food too. I considered using cherry juice but the extra texture of the fruit embedded in the salt makes thing a lot more fun! Note: I didn't provide any tips this time as I normally do, since there's not much to really look out for except one thing, check the pan occasionally to avoid burning. A little browning is good to get some complex flavors of caramelization but beyond that it is the easiest seasoning to prepare. 1. Place the cherry juice and salt flakes in a medium sized bowl. Fold to combine. Wrap the bowl with clingfilm and place in refrigerator overnight. 2. The next day transfer the entire mixture into a oven-safe ceramic dish (a baking dish will work). Spread the mixture with the liquid in an even layer. Place the dish in a preheated oven at 325F on lower two-third's shelf and allow to dehydrate for about 2 to 2 1/2 hours. Check every 20 minutes to make sure the cherries aren't burning and the mixture is dehydrating. The juice will evaporate and large salt crystals will form. Some of the sugars in the cherry juice will caramelize a little and brown. Remove the pan from the oven and allow to cool to room temperature on a wire rack. Once cooled transfer to an airtight container for storage. The salt should be good for about two months of stored properly. First things first, the winner of the Wolf Gourmet giveaway is Angela Fields. Congratulations!!! Angela, please send me an email so I can have your shiny new cookware sent out to you. 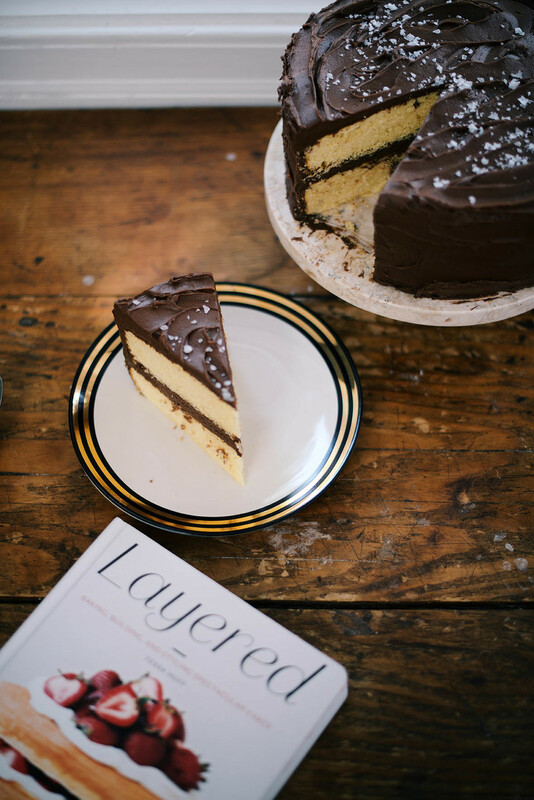 When Tessa Huff (who is a cake maven) asked me to share a cake recipe from her new book Layered, I immediately went with her birthday cake. Tessa's blog, if you aren't familiar with it already, is full of delicious cakes and treats made with unique flavors and styles. There's a cake for every occasion to bake and plenty of tasty ones to choose from. 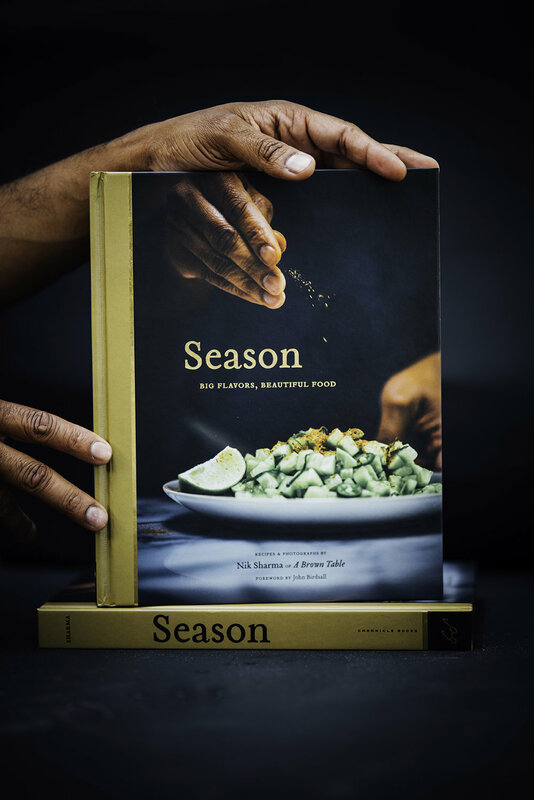 From rhubarb, to zucchini to tea infused cakes, you will have a blast going through the book and cooking from it. A yellow layer cake frosted with chocolate buttercream fudge frosting. It's simple yet decadent and delightful, everything a birthday cake should be! I've added a light sprinkling of maldon salt flakes for color and flavor. Make sure you use good quality chocolate and cocoa for the frosting, it makes a huge difference in flavor. Yellow layer cakes are made with egg yolks which give the cake it's color and name. The crumb is soft and delicate and a spoonful with a layer of chocolate fudge frosting, goes a deliciously long way! Tessa is also giving away a copy of her book to one lucky reader (contest is open to US and Canadian readers only) from here. The giveaway is open for a week and ends on April 29th, 2016. I'll pick a random winner, all you need to do is leave a comment below and share the name of your favorite birthday cake. Please don't forget to leave your email address so I can contact you. Good luck and happy baking! Note that I made a two layer cake instead of four. I used dark unsweetened cocoa powder for the frosting to give it a deeper chocolate flavor. When making a chocolate based fudge frosting you should end up with a frosting that is soft and smooth. This is important when you frost the cake or it will rip the cake as you move against the grain of the cake with the offset spatula. I usually add more heavy cream (1 tablespoon at a time) to the frosting until it feels smooth and silky. It should be thick enough to hold its shape yet soft enough to frost. Adding the salt flakes at the end is optional. Since salt is hygroscopic, it will absorb moisture from air so watch out for that. You could also sprinkle salt flakes on each slice just before serving. 1. Preheat the oven to 350F. Grease and butter two 8 inch cake pans and set aside. 2. Sift together the flour, baking powder, and salt and set aside. 3. In the bowl of a stand mixer fitted with a paddle attachment, beat the butter on medium speed until smooth. Add the sugar and mix on medium-high until the butter is light and fluffy. Add the sugar and mix on medium-high until the butter is light and fluffy, 3 to 5 minutes. Stop the mixer and scrape down the bowl. 4. Turn the mixer to medium-low and add the vanilla and egg yolks, one at a time. Stop the mixer and scrape down the bowl. 5. Turn the mixer to low and add the flour mixture in three batches, alternating with milk, beginning and ending with the flour mixture. Mix on medium for no more than 30 seconds after the last streaks of the dry ingredients are combined. 6. Evenly divide the batter between the prepared pans. Bake for 25 to 38 minutes or until a toothpick inserted into the cake comes out clean. Let them cool on a wire rack for 10 to 15 minutes before removing the cakes from their pans. 1. In the bowl of a stand mixer fitted with a paddle attachment, beat the butter until smooth and creamy. With the mixer on low, gradually add the confectioner's sugar, cocoa powder, vanilla and salt. Pour in the cream and mix until incorporated. Turn the mixer to high and mix until the frosting is light and fluffy. Stop the mixer and scrape down the bowl. Add the chocolate and mix until smooth. 2. To assemble the cake: Once the cakes have completely cooled, carefully halve them horizontally (I didn't do this) to create four even layers of cake. Level the cakes and choose which layer will be at the bottom. Place it on a plate or serving dish. Spread 3/4 cup of the frosting with an offset spatula. Place the next layer of cake on the top and repeat. Frost with remaining fudge frosting. Sprinkle the top of the frosted cake with a little maldon salt flakes if desired. Friends, there are just a few days left to vote for my blog, in the Saveur Food Blog Awards in the Best Photography category. If you haven't had a chance to do so, I'd appreciate if you could take a moment to vote for my blog and a bunch of other lovely blogs nominated this year. I promise this is the last time I will bug you about it! It's funny how I find myself associating certain foods with certain things or moods. Take popcorn for example, movies are the first thing that come to mind. Be it at the theater or at home, popcorn is what M and will get, mind you we get the humongous bucket. I tend to gobble it down pretty fast and M's always complaining that he never gets any. Mind you, he's the one holding onto the bucket. At the theater, it's always those first few minutes during trailers (I love trailers, I can never get enough of them at the movies) that two of us tend to eat as much as we can, after that moment has passed and the movie begins, we stop eating. Besides popcorn or some chocolate, I don't order anything when we go out to the movies because at most theaters the food doesn't seem that appealing (though there are a few fun places with good snacks). When at home, however for movie night, I'll try to fancy it up with nachos and lots of melted cheese, popcorn with a few different flavors and ice cream! Yes, considering, how much I love ice cream, if I plan ahead well in advance, I'll make us a batch of some type of ice cream. At this time of the year, it's movie time! All the new trailers are released, to a movie buff, it's what makes summer exciting. There's the new Star Wars trailer, the new Avenger's movie, Mr Holmes, and so many others (If you haven't already guessed I'm a huge fan of scifi, fantasy, thrillers, horror and independent foreign films). But what if I said I've combined two of my favorite movie treats into one! Yup, in the form of a popcorn infused ice cream! 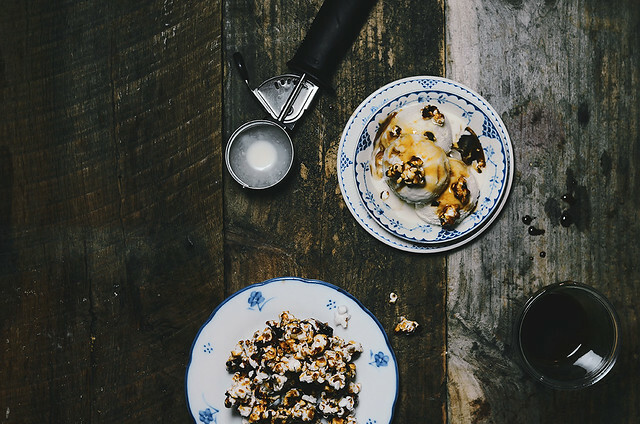 This ice cream has the buttery flavor and fragrance of freshly popped corn and added to that, I've gone and garnished it off with Maldon salt flakes and caramel crusted popcorn with a generous drizzle of caramel sauce. I used the white popcorn kernels from Bob's Red Mill which gave this ice cream a great flavor. You can use store bought homemade caramel sauce and caramel coated popcorn, if you're low on time. This ice cream has that light yet unmistakable flavor of popcorn that I love. After steeping the popcorn in the milk, I grind the popcorn down to break it into little bits. The brown kernels aren't that much fun to eat in the ice cream which is why I recommend letting the milk sit and then removing the brown bits by decanting the milk. I don't recommend passing the milk through a sieve as you will lose out the white bits of the popcorn. Pick out the good popped popcorn for steeping, do not use the few that might be burnt (if you use the stove top method). It will contribute a burnt taste to the ice cream which you do not want. The steeping is most effective if you had the hot milk to freshly popped popcorn and letting it sit overnight. That gives maximum flavor. 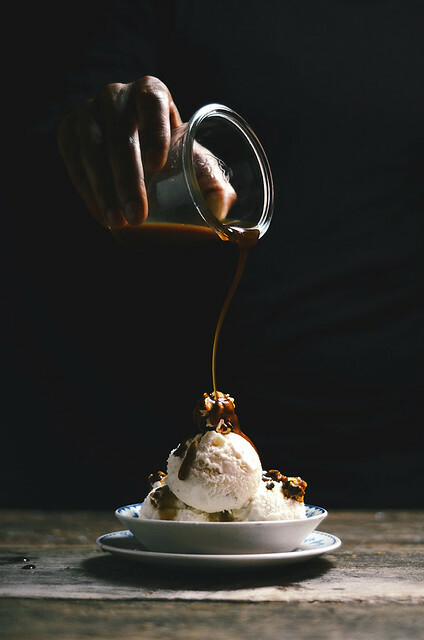 The caramel popcorn and caramel sauce might be a little more than you need per scoop but a little extra never hurts! Disclaimer: This post is sponsored by Bob's Red Mill. All opinions expressed here are purely my own. 1. Place the 3 cups of milk in a medium-sized heavy saucepan and heat on medium-high until the milk begins to just boil. Remove from stove and keep hot until ready to use. 2. In the mean time, place the corn kernels in a large heavy saucepan and cover with a lid. Heat on medium-high until the kernels begin to pop. Shake the saucepan during cooking until almost all the kernels pop and remove from stove. Alternatively, you can also pop the kernels in an electronic popcorn maker or in an oven or using any method you prefer. 3. 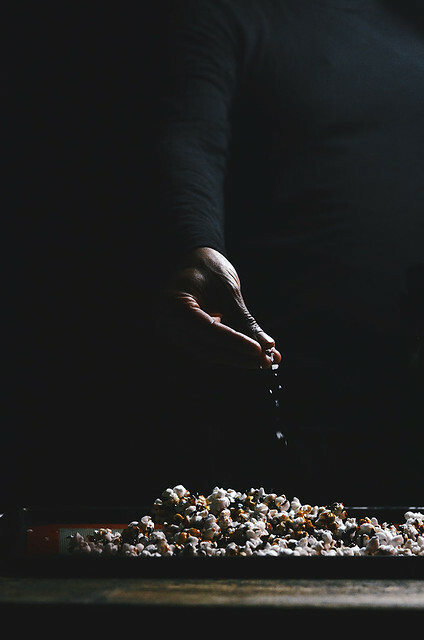 Immediately transfer the hot popcorn into a medium-sized heat proof bowl, discard any unpopped kernels or burnt popcorn and pour the hot milk over the popcorn. Cover the bowl with a lid or clingfilm and allow to steep overnight in the refrigerator. 5. Add the heavy cream, sugar and honey to the milk. Heat on medium-high with occasional stirring. Whisk the cornstarch with the 4 tablespoons of milk. 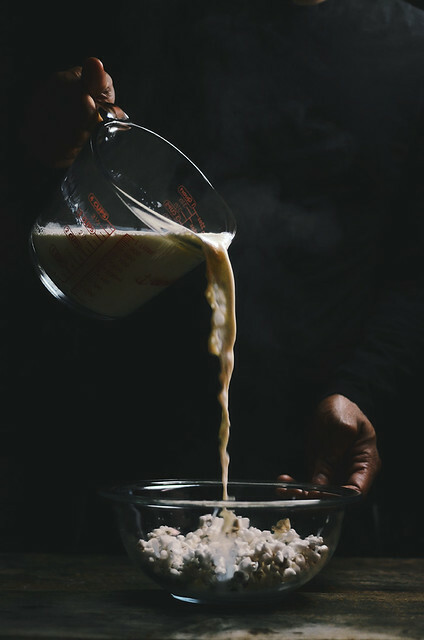 Once the milk starts to boil, quickly whisk in the cornstarch and whisk vigorously until the mixture begins to thicken. Boil for 1 to 2 minutes or until the ice cream base has acquired a thick custard like consistency. Remove from stove and transfer the ice cream base to a ziplock bag and seal airtight. Chill in an ice water bath completely for about 35-40 minutes. Pour the ice cream base into a prefrozen chilled canister of your ice cream maker and follow the manufacturer's instructions. Transfer the ice cream into a freezer proof airtight container and freeze for at least 6 hours, preferably overnight before serving. 1. Place the popcorn and oil in a large heavy base saucepan with a lid. Cook on medium-high heat and shake the saucepan occasionally to ensure all the kernels pop. 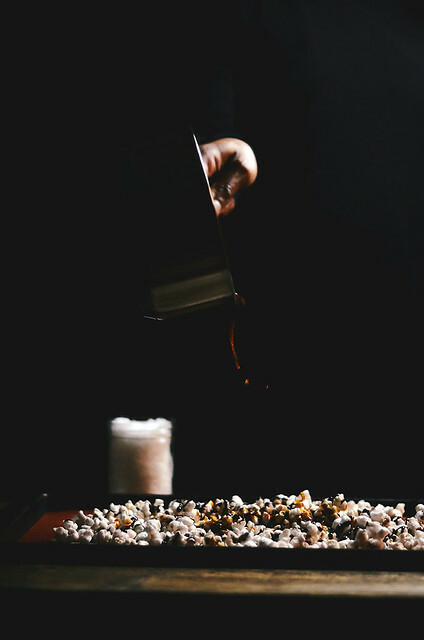 Remove from heat and place the popped kernels on a baking sheet lined with parchment paper or a silicone baking mat. 2. Heat the sugar and butter in a medium and cook with constant stirring until the mixture reaches 250 degrees. Drizzle this hot mixture over the popcorn and followed by the maldon sea salt flakes. Mix with a wooden spoon and allow to cool completely and harden. Crack and use as needed as a garnish for the popcorn ice cream.